Building models is a very common project in the architectural field. Many times, architects will need to build a model to give the client a good idea of how their structure will look. People typically from the age of 7 and up will use models for school projects, hobbies and for business presentations. In order to scale down an object like a building, for example, you will first need to know the dimensions of the building, and know some basic math to figure out the scale to which you need to build your model. Write the original dimensions of the height and width next to the appropriate sides. Put this number in feet. For this example, the height will be 40 feet, and the width will be 40 feet in order to simplify the math. We will create a model scale one tenth of the original size. Multiply the height by 12, because 12 inches equals one foot. So now you will have the measurements in inches. The product you should have reached was 480 inches. 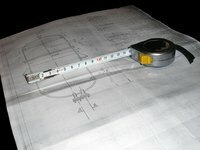 You can use any measurement you want, for this example I have used inches for the simple conversion. Divide 480 by 10. The product is 48. So now we will make a scale model in which the building is 48 inches high by 48 inches wide. Choose your medium and build the model building 48 inches tall by 48 inches wide.